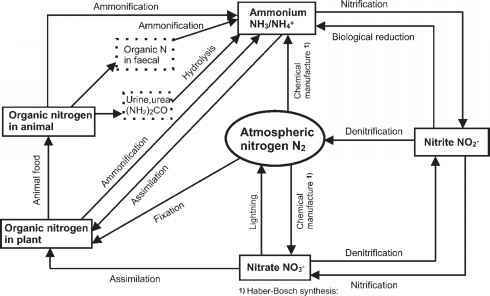 NSAs and their substituted analogs are commonly found in the wastewater from the production of azo dyes together with 1-hydroxonaphtalene, wetting agents, dispersants and other surfactants (Nortemann and Hempel 1991) at concentrations up to 4300 mg L-1 COD (Krull and Hempel 1993). Naphthalene sulfonic acids which are of high significance for the production of azo dyes are, for example, naphthalene-2-sulfonic acid (2 NSA) or 6-amino naphthalene 2-sulfonic acid (6-A 2-NSA; Fig. 9.8a). In aerobic WWTPs they are non-biodegradable because bacteria which are able to use these compounds as a source of carbon, nitrogen or energy are washed out because of their low growth rates. Nortemann and Hempel (1991) were successful in obtaining aerobic enrichment cultures of adapted bacteria with 6-A 2-NSA as the only substrate. Results for different dilution rates (D) are presented in Fig. 9.8b (Diekmann et al. 1988). Fig. 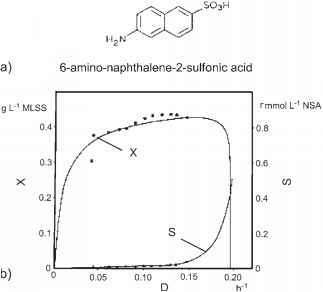 9.8 Concentration of 6-aminonaphthalene-2-sulfonic acid (6-A-2-NSA) and bacterial concentration depending on dilution rate D.
Hempel 1989). Experiments with an airlift-loop reactor and sand as support material for bacteria were very successful (Diekmann et al. 1988). Table 9.9 includes other kinetic coefficients regarding the biodegradation of naphthalene sulfonic acids obtained by the same group. Some NSAs seem to be non-biodegradable. Until now, it has not been possible to transform some NDSAs, e.g. 1,5-naphthalene disulfonic acid. Breithaupt et al. (2001b) were successful in mineralizing this compound only by a two-step process of ozonation and biodegradation (Wiesmann 2002). Table 9.9 Stoichiometric and kinetic coefficients for aerobic degradation of naphthalene sulfonic acids. a) g MLSS (g COD)-1; b) d-1; c) mg L-1 COD; d) Maintenance coefficient, g COD (kg MLSS • d)-1. The COD of the dye liquor is very high, but it cannot be used for further dying because of its excessive water content and various impurities. It is separated, transported and often incinerated with solid wastes. Dye houses with a direct discharge into surface water have to treat the wastewater after mixing with other waste streams. An activated sludge process is often used without a noticeable degree of mineralization of the used dyes. Dye houses with an indirect discharge into the sewerage system are generally not required to pretreat the wastewater. We are convinced that this situation must be changed in future. Suitable pre-treatment processes have to be developed (Sosath and Libra 1997).